Artist Mindy Belloff is the first contemporary printer to recreate the world-changing Declaration of Independence in 2009, as originally printed by a woman, Mary Katharine Goddard in January 1777. During our country’s infancy, Congress ordered two official printings of the Declaration of Independence. On July 4th, 1776, the Declaration of Independence was authorized to be printed by John Dunlap of Philadelphia. The design of the Dunlap printing resembles the written document, with each line running across the page in a single column length. On January 18, 1777, Congress convened in Baltimore and ordered the second printing by Mary Katharine Goddard. This edition is outstanding as the only Declaration titled The Unanimous Declaration of the Thirteen United States of America, having been printed after New York had finally cast its vote to form the thirteenth state, and as the very first printing to publicly reveal the names of all the members of the Second Continental Congress. 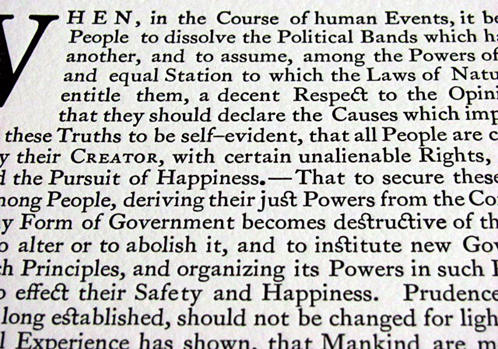 Also unique about this Declaration is the Printress, a highly respected press woman, whose fresh design in two-columns set it apart. Most people are not aware of this important historic printing by Mary Katharine Goddard. 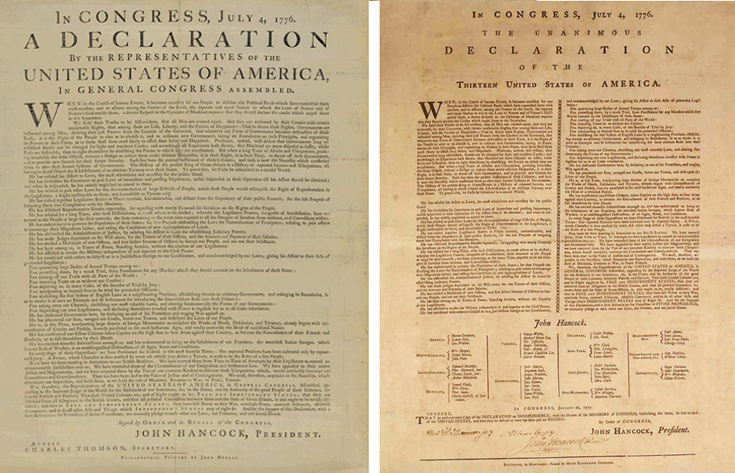 While there have been numerous facsimiles of the Dunlap document over the past two centuries, until Mindy Belloff’s announcement of her project in January 2009, there had been no reprinting of the 1777 Goddard Broadside. Mary Katharine Goddard was born in 1738. Her family was in the printing business. Along with her brother William, Mary K. printed newspapers in Providence, Philadelphia, and Maryland. In addition to being a journalist and editor, producing a weekly newspaper, she was appointed the first woman Postmistress of Baltimore, a position she held for 14 years. By printing the Declaration and boldly adding her own name to the bottom of the document along with those of the Founding Fathers, Goddard put herself at great risk for treason and possible death. By her actions and life choices, Mary Katharine Goddard was clearly a courageous Daughter of Liberty and proponent of freedom of the press and the right to uncensored expression. Only nine known copies of the Goddard Broadside exist today. 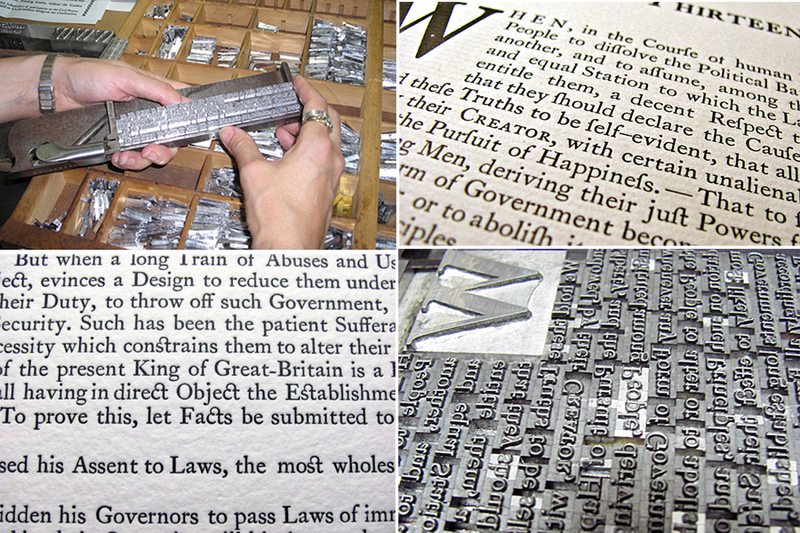 To honor Mary Katharine, Mindy Belloff of Intima Press spent close to a year researching and accurately reproducing Goddard’s 18th-century design and printing, in 2009. She hand set over 6,000 characters in Caslon typeface (as the original), and letterpress printed them one at a time on paper hand made specifically for the historic re-creation. The museum quality edition is limited to 100 copies. 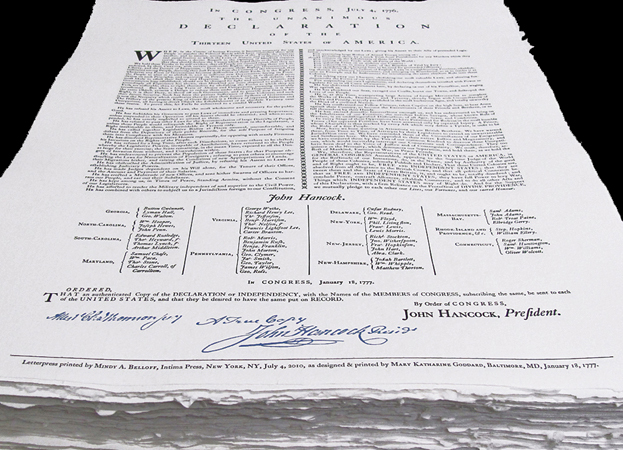 Each Declaration of Independence is 21 x 16 inches and is protected in an archival paper portfolio. A letterpress printed sheet of essays in blue and red ink on white paper, includes text by the artist with an introduction by David Armitage, Professor of History, Harvard University and author of The Declaration of Independence: A Global History; and an essay by Martha J. King, Historian of early America. 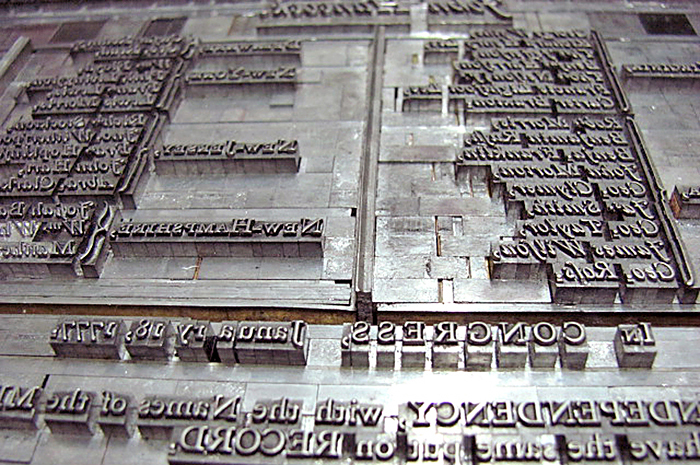 Intima Press 2009 (the Goddard recreation project was announced at the annual American Printing History Association meeting January 2009 and on IntimaPress.com). Copies of the historic recreation limited edition are available at $825 (+ shipping). (custom made by St. Armand, CN); Edition Limited to 118. Contemporary edition is available for $725 (+ shipping). Prices of the broadsides increase over time. Additional information on Mary K and details on the Making of the Declaration Re-creation by Mindy Belloff was printed in the Guild of Book Workers Journal. An expanded self-published essay will be available soon. The Broadsides may be viewed in several permanent collections including the Library of Congress, the British Library, the New York Historical Society, the Thomas Jefferson Foundation Library, the University of Virginia’s Albert H. Small Declaration of Independence Collection, Harvard University’s Widener Library, Brown University’s John Carter Brown Library, the Massachusetts Historical Society, and Johns Hopkins Rare Books and Manuscripts Collections, to name a few. Mary K: Please note, most spellings of Mary Katharine Goddard’s middle name are incorrect, shown as Katherine with an “e” instead of Mary Katharine Goddard (Katharine with an “a” as she set in her colophon). “Your printing is a beautiful and faithful rendition.” – Dennis S.
“It is really beautiful. I love it!” – Jim G.
“It’s lovely. 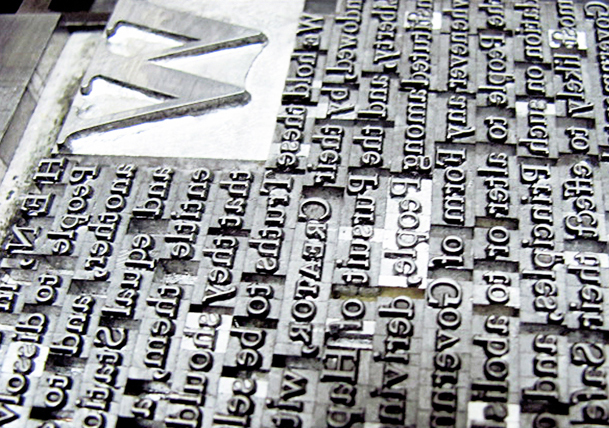 Beautiful presswork.” – William A.